Isn’t that backwards? In this era of declining budgets, a need for persistence (in general), and an almost total lack of contested airspace, isn’t the onus on the Air Force to prove a need for the use of human pilots? Why are we still considering manned aircraft the default, and only operating them remotely in particular circumstances? I guess it seems as if there’s no overwhelming rationale for maintaining pilot primacy with the vast majority of missions. And I’m the first to admit I would try and have it both ways: if the airspace is too dangerous, then of course we’d want to minimize pilot risk and maximize unmanned platforms. If airspace is uncontested, then it would seem that the skill and reaction time of a human pilot is unwarranted. Obviously, manned flight isn’t going anywhere, but to declare the Air Force as essentially a force of human-piloted aircraft, except for a few instances, seems to be ignoring the larger trends and gains to be had from unmanned aviation. (Original link h/t Rich Ganske). 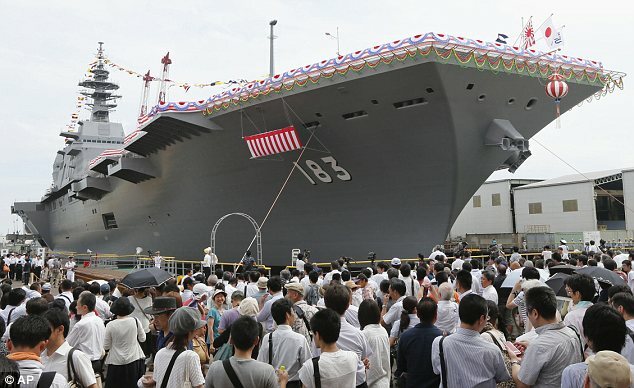 Japan unveiled its biggest warship since World War II on Tuesday, a $1.2 billion helicopter carrier aimed at defending territorial claims. The move drew criticism from regional rival China, which accused its neighbor of “constant” military expansion. The ceremony to showcase the 248-meter (810-feet) vessel came as Shinzo Abe’s conservative government, which took office last December, considers ditching the nation’s pacifist constitution and beefing up the military. Japan plans to use the helicopter carrier, named Izumo and expected to go into service in 2015, to defend territorial claims following maritime skirmishes with China, which has demonstrated its own military ambitions in recent years. This is via Nick Prime, who points out the theoretical possibility of fielding the F-35 on these. (Here’s another story). Which, honestly, is what I thought was basically the only thing keeping the B variant alive. It’s not just the USMC that needs a VTOL-capable aircraft (or in the case of the JSF, “aircraft”), but a lot of our allies and partners in the region who have been investing in flattops like these (see: HMAS Canberra, ROKS Dokdo, etc.) with the possibility of flying such planes off of them. Even the Europeans are getting in on it – the French have a pretty good platform in the Mistral class, hence the brouhaha over the Russian acquisition of four of them. And in that case, there had better be an aircraft that can use the short-decks. I mean, helicopters are great and all, but if we’re going to at least play bluewater navy and accept that power projection via the aircraft carrier is still a) relevant, and b) desirable, then doing it on the cheap is probably the best compromise. At this point you might as well assume that you’re going to lose them, so why not go for the more basic version? The Marines probably aren’t thrilled about a CAS aircraft that’s only 80% better than its predecessor (though certainly more than 80% more costly), but the key is that it’s not just for them. Our friends are getting in the game, and that’s not a bad thing. Anyways, it is nice to see the JMSDF get a new flagship (that’s how they determine them, right? The biggest?). And one whose name has an interesting history, too. UPDATE: Kyle Mizokami, as usual, has written excellent words on the Izumo. Short version: Japan’s going to have to go big or go home. 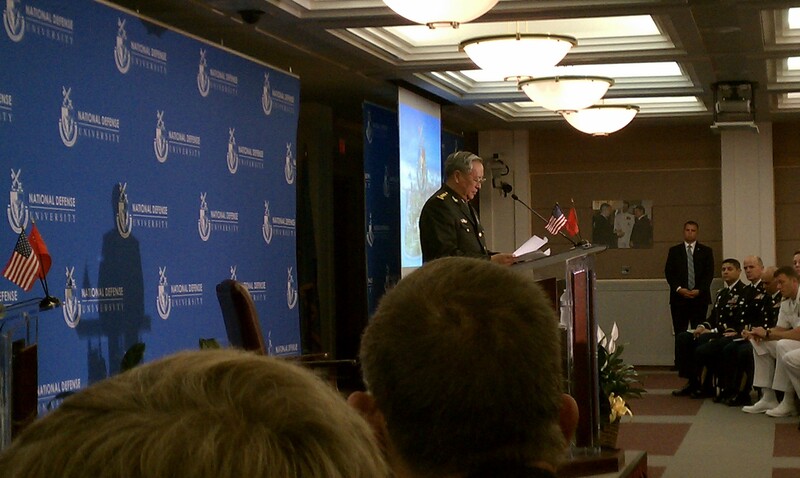 Chinese Minster of Defense General Chen Bingde delivers remarks at the National Defense University, May 18, 2011. The most difficult part about watching an official speech – be it on policy or otherwise – is to separate the platitudes from the substance, assuming there is any of the latter. The meat of public remarks can often be found in soundbite form, or on a single slide of a powerpoint presentation. It is also equally possible to sit through an entire thirty minute speech and to hear absolutely nothing that hasn’t been said before. Fortunately, that was not the case when Chen Bingde spoke at the National Defense University last week. While granted, much of the talk consisted of appeals to American sensibilities and national interests, there were some moments of real substance in it. A nuclear bomb detonated by the French government at the Mururoa atoll, French Polynesia, 1971. A fantastic photo series, “When We Tested Nuclear Weapons,” is up at The Atlantic. Some are downright beautiful. All are haunting. Death actually has a very complete and varied wardrobe that includes pajamas and snuggies. 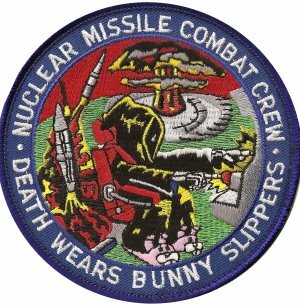 Also, nuclear silo duty can get boring.